Astronauts could follow in 2028, NASA says. An artist's depiction of NASA's proposed lunar Gateway. THE WOODLANDS, Texas — NASA's timeline for lunar exploration has tended to jump from sending small commercial landers as soon as possible to getting human missions there by 2028, but on Monday (March 18), agency officials offered a target date for a key intermediate step: They want to put a rover on the moon by 2023. Those comments came during a NASA town hall at the Lunar and Planetary Science Conference being held here this week. During the event, agency leaders emphasized the current focus on the moon, both from the science perspective and from the human-exploration perspective. They also walked through the timeline expected for some of these milestones. NASA had already announced that it was hoping to place science instruments on the surface with commercially built landers as soon as this year, and that its end target was to land humans by 2028. But intermediate steps hadn't been discussed in much detail. During Monday's presentation, that changed. "We're trying to get to the moon with a rover as soon as possible, we're really trying to target 2023," Steve Clarke, the deputy associate administrator for exploration within the Science Mission Directorate, said during the event. Clarke added that such a rover could be important for studying volatile compounds on the moon, a class of chemicals that includes water. He also suggested such a rover could clock in between 660 and 1,100 lbs. (300 and 500 kilograms). He also discussed advanced capabilities rovers could take on. "Certainly, we'll be going to one of the poles," Clarke said. "And long-duration operation, we'd like to be able to go and operate for a period of months, not just weeks." Clarke did not specify whether developing these capabilities would be feasible by the 2023 schedule goal, or whether they would be included only in a second generation of lunar rovers. Throughout the event, NASA personnel seemed to emphasize the agency's desire to make sure scientists feel included in the quest to return humans to the moon, which can sometimes feel like a separate endeavor directed toward separate goals. 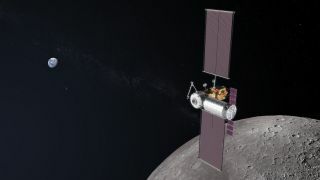 That science focus included the major piece of infrastructure within NASA's moon plans, a space station nicknamed Gateway, which would serve as a base camp for both science projects and astronaut missions. "For us to understand how to develop the Gateway, we need to understand how you'd like to utilize it," Jake Bleacher, acting chief exploration scientist in the Human Exploration and Operations Mission Directorate, said during yesterday's event. Of course, NASA isn't just waiting around for scientists' wish lists; the agency has its own as well. "Ultimately, I think we would all like to get more pieces of the moon back to Earth," Bleacher said. "I think Gateway might play a role in that."